A new release at Moyglare Hall, off the eponymous Moyglare Road in Maynooth, goes on the market this weekend, just a week after the launch at a neighbouring site of Mariavilla, one of the largest residential schemes to be released in the university town in the post-crash era. Multiple phases have been built at Moyglare Hall since construction first began in 2005. Eleven homes will be released tomorrow with a final phase of 20 houses earmarked for later in the year. 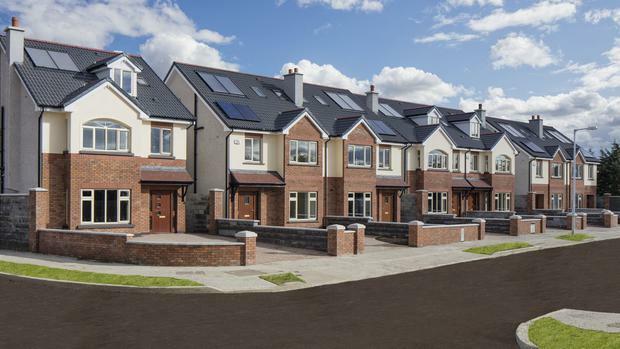 Prices in the latest tranche start at €355,000 for a three-bed terraced house measuring 1,115 sq ft and at €410,000 for a semi-detached version with 1,425 sq ft of living space. The four-bed semis, which span 1,600 sq ft, cost from €460,000, while the five-bed detached style with 1,850 sq ft of accommodation is priced from €550,000. The facade of each house is finished in a combination of Butterly brick and render, with front gardens overlooking a communal green. The houses have an A3 BER and are equipped with solar panels to generate hot water and PV panels for electricity. Dublin city is 25-minutes away, while Kildare station is within walking distance. A new vehicular entrance opposite the GAA club has just been finished. The access point is beside the two showhouses on view between 11.30am and 1pm tomorrow and Sunday.